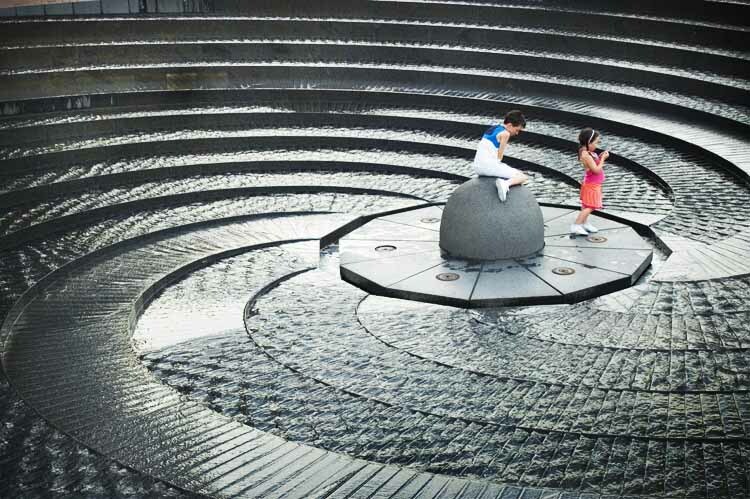 The spiral stair fountain is just one of many water inspired elements to the already stunning Darling Harbour of Sydney! Sydney is by far one of our travel clubs favorite cities in the world and Darling Harbour is one of many reasons why. This cool shot was taken of a beautiful spiral stair fountain located on one end of the harbour. Children get a kick out of running around the stairs to the center and back. Darling Harbour is full of great restaurants, nightlife, the aquarium, boat tours, movie theaters, and more! At night the whole place lights up brilliantly full of color from the surrounding restaurants and nightclubs. The colors bounce off the harbour waters making it wonderful place to walk around after dinner! This is a very cool fountain! From everything I’ve heard, I can understand why Sydney is one of your favorite cities. I think it will be one of mine once I’m lucky enough to go there. I bet it will! You gotta go! Yeah totally. I’ve walked throughout Sydney for over 8 hours and you could do this for 10 days straight without seeing it all. haha thats sweet! I took this shot back in ’08 when I lived there near Glebe. I love that city so much. Must have been a great place to grow up. Huh. I’m sad to say I missed this when I was in Sydney. Something to look for the next time I’m there.